Before he kicked off his hosting duties, Jamie Foxx posed on the white carpet with his daughter Corinne Foxx this evening(June 24th) at the 2018 BET Awards at the Microsoft Theater in LA. 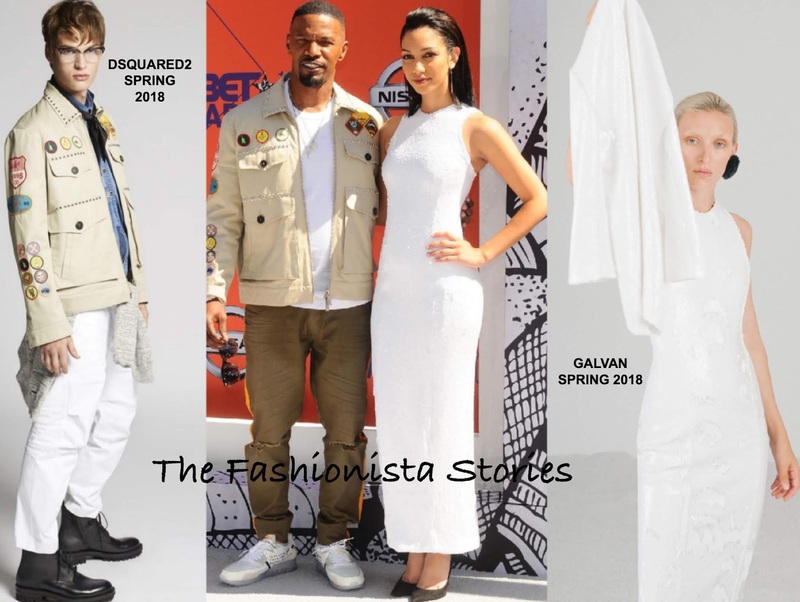 Jamie Foxx rocked a DSQUARED2 SPRING 2018 beige cotton twill, patchwork jacket which he teamed with a white t-shirt and olive, side stripe pants. It was a bit too warm for the jacket but I still liked his casual, cool look. Corinne Foxx wore the GALVAN SPRING 2018 'Salar' white sequin column dress which she paired simply with black pumps. Keeping the styling of her look simple, she finished up with pulled back tresses and a colored lip.